There’s nothing wrong with the rooms at the concrete multistorey monolith that is Thaveesinh. Ad Book now! Rates from US$16.53++. Average rating 6.1 from 25 reviews. It’s just that they’re a bit bland for the price and the bed coverings are of the same quality as the cheapie places in town – gaudy and dated. Rooms have standard Lao beds with poor quality sheets, old TVs, hot water bathrooms that could do with more light and some have old air-con units. Free WiFi is also available, but as with most places in town, it’s patchy in the rooms. If the rooms were 20,000 kip cheaper, we’d recommend this alongside the likes of Friendship, but at these rates it’s slightly overpriced. 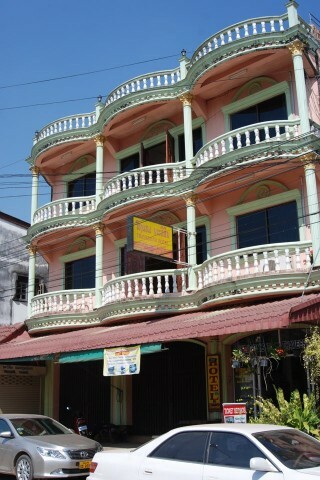 Kaupjai Guesthouse is the same price and far better. Thaveesinh is located directly opposite the Gibbon Experience office. Check rates at Thaveesinh Hotel on Booking.com.